Are you trying to meet your competitor or are you wanting to beat your competitor? Even if you have the exact same products or services you can set yourself apart from the pack. Some companies hang their hat on great service. In today’s market place offering great service is expected. Not to mention that it is easy to talk about but not always that easy to back up those claims. One of the things that Steve and Michelle have always told their kids is that words are cheap and just because someone says something doesn’t mean it is true. Getting a buyer/customer to switch from what they know to be the exact same thing only with “Better Service” is a tough case to make. The customer has to have a horrible experience with the provider to make a change. Sometimes even a horrible experience isn’t even enough to make a change. It is easier to stay with what you know even if the customer does not like it. This is similar to changing from one bank to another. Maybe the customer does not like the bank they are with but the pain of change is greater than the pain of staying. The pressure on some government agencies is getting bad and they have recieved so much grief that even they are getting in on the offering great/better customer service game. Several years ago here in Indiana our new Governor (Mitch Daniels) made an election promise that he would work to make service to the citizens of Indiana easier and less painful. The first place he started was at the BMV. So he went out into the state with a marketing campaign to tell the citizens of Indiana that this is a huge undertaking and it is liable to get worse before it gets better. Going to the BMV used to be a painful multi hour experience. And most of the time you would end up having to go home and bring something back. He was correct, it got much worse but then it started getting better and now they have service metrics and managers walking behind the workers to get the wait times down as well as limiting the return trips. The managers are even going to the workers and asking what the service time is. Today going to the BMV in Indiana is almost down right pleasant and (normally no more than 15 to 20 minutes) fast. The BMV isn’t perfect but it is much better! In order to ease the pain of change, the first thing a provider needs to do is to make a connection and in most cases the start of that connection is made with sound marketing principles to set one company apart from another. Once that connection is made then the company has the opportunity to show the buyer that their service is better than the competition. Now is the age old question: What is it that makes us better than the other guy? Let’s look at some of the things that companies have done to set themselves apart while offering very similar products or services as the competition. The examples being highlighted are for the most part very large companies that are recognizable. That doesn’t mean that they have always been very large. Some of these examples started out as either new products launches or small companies. The small to mid-size company needs to use creativity to market themselves to get these kinds of results and attention to their Brand. Mascots are used to endear or create a relationship between the company and the potential buyers to a product or service. Mascots also create good will between existing customers making retention much easier. Mascots break down barriers and are downright fun and it is pretty hard to take yourself too serious if you have a big furry whatever in your marketing campaign. 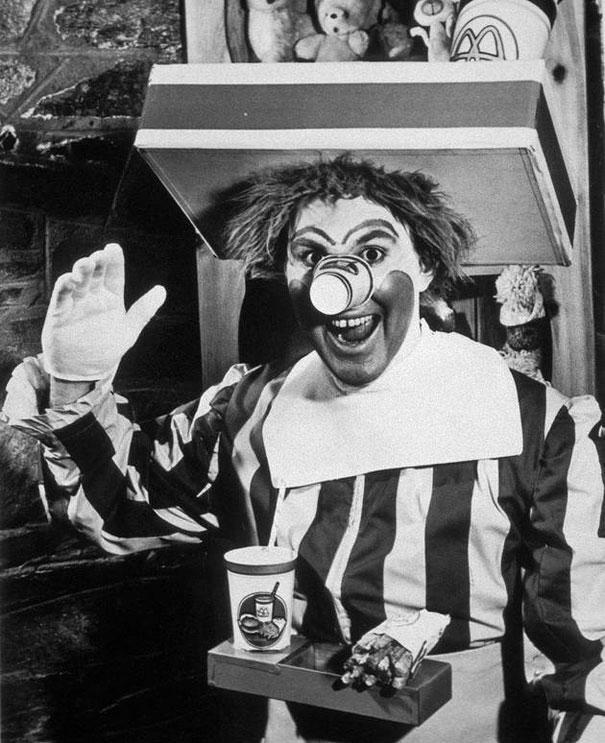 Ronald McDonald was first seen in Washington, DC in 1963 and was played by Willard Scott who was also a weatherman later in life for the Today Show. The amazing thing about the start of this iconic (second only to Santa Clause in the United States) character is that this was not an idea of the McDonald’s corporation. 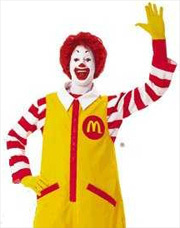 Ronald was started by the local franchisee to increase sales by sponsoring the Bozo show. That franchisee saw a 30% increase in sales very quickly. Click on the picture below to see a video of the first Ronald McDonald in a 1963 McDonald’s commercial. Ronald McDonald as we know him today. Mr. Clean the product was started by Linwood Burton (originally a chemist) an owner of a ship cleaning service. He developed the product to limit the disability claims of his workers. In 1958 Mr. Burton sold the cleaner to Proctor and Gamble which introduced the cleaner for sale to households. 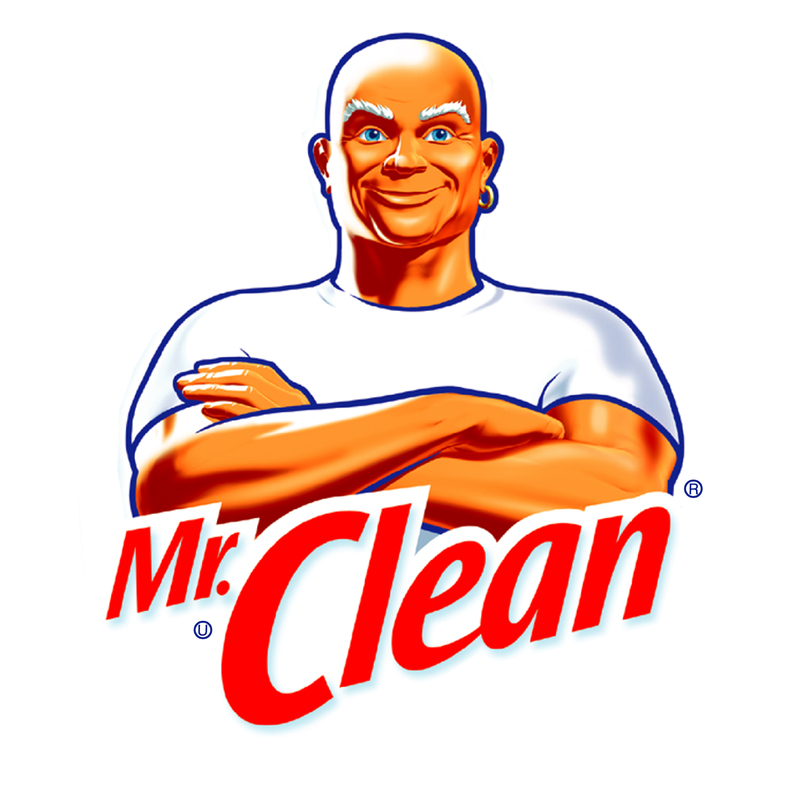 Within 6 months of the introduction, Mr. Clean became the bestselling household cleaner in the United States. This product is still one of the strong brands for Proctor & Gamble today. 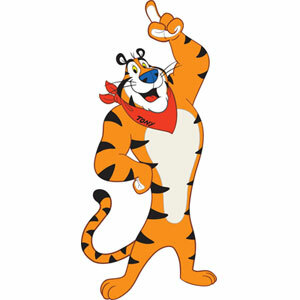 Tony the Tiger was first introduced by way of a contest in the early 1950’s. The contest was to decide which character would represent Sugar Frosted Flakes. Martin Provensen was chosen to do the final illustrations for the contest between Tony the Tiger, Katy the Kangaroo, Elmo the Elephant, and Newt the Gnu (A wildebeest). Tony won the contest and was awarded the front of the box of cereal. Tony has remained on the box in spite of a name change in 1983 from Sugar Frosted Flakes to Frosted Flakes due to health concerns of too much sugar in the American Diet. 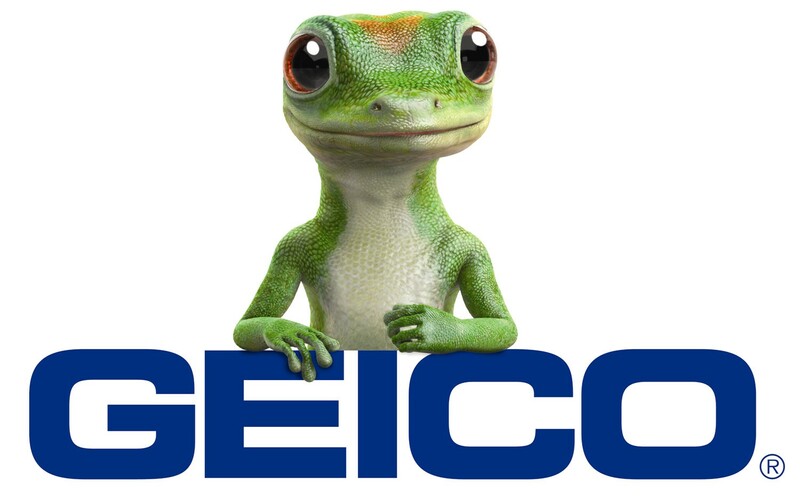 The Geico Gecko is the most popular of 6 (3 cavemen, Kash the stack of cash, Maxwell the Pig, and the Gecko) Geico which is a Berkshire Hathaway Company has been using characters like this since they starting doing National TV ads around 1990. In many cases they hardly even mention car insurance at all. This is a sign that the marketing efforts of Geico have worked. The characters are so well recognized that they do not even really need to say anything about their product. This is the sweet spot that every company/advertiser wants to attain. One of the 30 second Cavemen spots had only 6 seconds at the very end of the commercial that talked about Geico Insurance. Jingles and slogans are designed to become a part of everyday life. Below is a list of many slogans. Take the test to see how many you can name (I bet it will be most of them). The answers are below the list of slogans. 2. The few the proud. 5. It takes a licking and keeps on ticking. 6. Melts in your mouth, not in your hands. 8. Good to the last drop. 11. Be all you can be. 13. 5 5 5 dollar foot long. 14. Have a _____ and a smile. 16. You desrve a break today at _____________? 17. They are magically delicious. 18. Ask about it at work. 19. You’re in good hands with ___________. Products or services that are similar but marketed different. These are some very good examples of exactly what companies need to do for their companies. They put on the creative hat and figured out what it is that people want. Or maybe the customer did not even have a want until the products and services below showed uo before them. Anyone that would call this a hotel better take another look. This destination is centered on couples spending time together and rekindling the relationship in an atmosphere that is conducive to being a couple. They put themselves squarely in THE anniversary, birthday, and getaway destination for couple’s niche. Never heard of that niche without jumping on a plane and traveling to an exotic island? Well that is probably because it didn’t really exist before they started back in 1974. This suite destination (depending on the suite you get) has personal in room water falls, waterslides, private garage, multiple floors, fire places, pools, spas, and anything else that a couple could want for time alone. While doing research for this part of the website we found many videos on youtube of people showing the suite that they were in. It was amazing how they all mentioned in one way or another how amazed they were about thier stay, and that destination. Check out the video below by clicking on the picture or visit the website to see how this company has set themselves apart from the crowd. - Let it be known that by showing the next two products Brand One Promotions not condoning the use one way or another of alcohol. Just merely showing how a product that is similar to another can make themselves very different from the competition in that category. 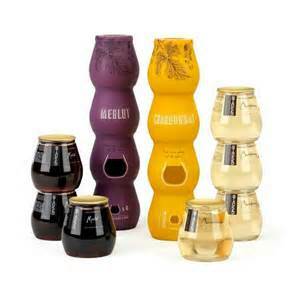 Stack Wine has made a niche for itself in the portable yet elegant wine segment for its customers. This product is similar to other as a premium California wine but they have made this wine into a stackable wine and glass set. A stack consist of 4 glasses that are stack one on another and packaged as a set. Packaging in todays market place in many cases is the difference between life and death for a product. You can check out the video by clicking the picture below. 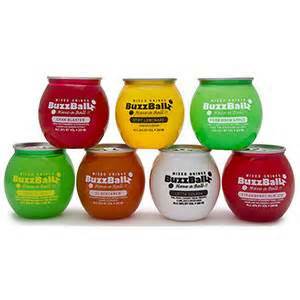 BuzzBallz are in a similar market to the Stack Wine only this is considered a spirit. This again is a break away from its competition because it is a portable and ready to drink spirit available in many flavors. The one (besides the wine vs. spirit) difference that we see is that these are available individually and because of that they would be great for a party to serve either cold or slushy. They also come in a 100% recyclable containers. The packaging on this is what makes it for us because it is both innovative and similar at the same time. Click on the photo below to see more about this product. Goats on the Roof is a gift shop like any other that Steve and Michelle saw while on a company retreat in Gatlinburg, Tennessee. Some may even call it a tourist trap. They don't generally visit places like this but when they were driving and saw it they thought why not check it out? Their marketing got the best of them. When pulling in they noticed there wasn’t any spots available for parking. The place was jammed up and it wasn't even the busy time of the year. These people know how to set themselves apart by doing a few simple things different than every other gift shop around. They built a building with dirt and a fence around one level and added goats. Neither the gift shop nor the goats are unique but when you throw them together you obviously have something special. You can see their website by clicking on the picture below. Brand One would love to add more ways that companies have set themselves apart. If you see something please let us know so we can share it.